On Tuesday morning, Sam had surgery under general anaesthetic, during which the doctors did a few things. The Port-a-cath is a round button like thing that is inserted under the skin, and which attaches to a vein. This makes it easy for giving I.V. treatments and taking blood without having to find a vein in the arm. It is still a needle poke through the skin, but it is relatively quick and easy. Sam will have the port-a-cath for the duration of his treatment, and when he is away from the hospital, the skin heals up and he can go swimming and have showers without worrying about it. The only negative is that sometimes they can get infected, in which case it would have to come out. Sam was not that happy with his port at first, mostly because it was quite sore from the surgery, however now I think he realises that it does make treatment a bit easier for him. The O.T. came around and showed Sam what the port looks like and how it works on Billy, the local port-a-cath doll. How do you explain leukaemia to a 6 year old? With puppets obviously. 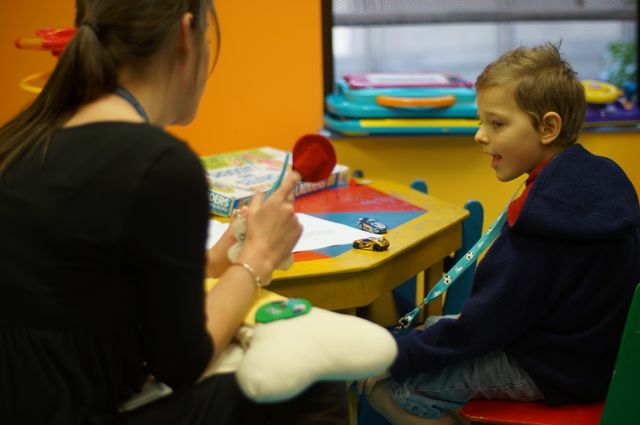 The hospital has some excellent Occupational Therapists who are there to help the children understand their illness in a way they can understand. Sam learned that his blood is sick. The factories in his bones make three different types of cells. Red blood cells, White blood cells, and platelets. The problem is that the factories in his bones are making white blood cells that are not quite right and not making enough of the other cells that his body needs. That’s where Captain Chemo comes in! His job is to kill the sick cells, but sometimes he gets carried away and accidentally kills some of the healthy cells as well, which can make you feel sick and tired. On Monday Sept 9, the teachers from Sam’s school, Hinterland Christian College came up to visit. They brought the biggest card in the world! It was covered in rockets that each student had written on as a message to Sam. They also brought in the first carrot from the school garden and presented that to Sam. There were many gifts that students had sent up for Sam, we could feel the love as the students sent up their own treasures to Sam to help ease his time in the hospital. 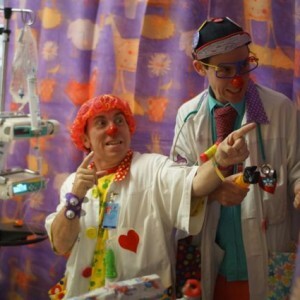 Clown Doctors, Spacemen, and Puppets. Thank you, thank you! to all the people who volunteer their time to help put a smile on a little person’s face. As we all know, hospitals are not exactly where you choose to go for a good time, but having unexpected funny visitors sure helped to brighten up the day. 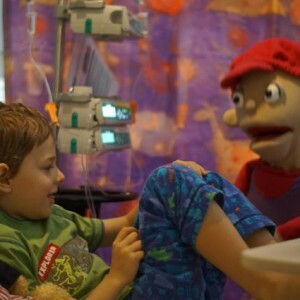 The Clown Doctors came and blew bubbles to clean Sam’s feet, The Starlight Foundation did magic tricks, and Camp Quality brought in a puppet. Coming in to Royal Children’s Hospital, Sam was happy, with Curious George riding on the stretcher rail. The Muddle Headed Wombat was a great distraction. Happy balloons sent by friends! 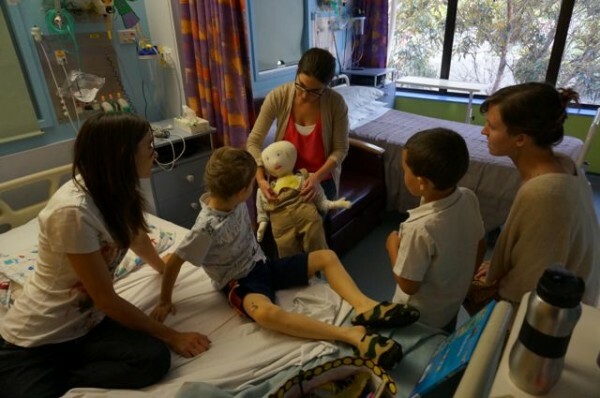 Sunday the 8th of May, we arrived at the Royal Children’s Hospital in Brisbane. Lorinda and Sam arrived by ambulance transfer from Tweed Heads Hospital, and I was driven up by a couple of good friends after going home to pack some clothes for our time in Brisbane. At this point we still didn’t have any information about Leukaemia or it’s treatment, we were very overwhelmed by the immensity of it all. Sam had been having leg and jaw pain for a few months and for the last few weeks had not been able to sleep because of the pain. We had been to the doctor’s a couple times, but on Sat Sept 7, we saw a different doctor, and he was very concerned. I want you to go straight to Tweed Hospital. How far away do you live? Maybe you can go and pack a bag first.